Hey all! Things might be a little quiet on the blog front, but that’s because other aspects of life have demanded more attention than usual. I am starting a new job tomorrow for which I am quite excited, but nervous too. I had worked in my previous position for three and a half years, so it will take some time adjusting to the newness of it all. I am still reading Middlemarch and expect that I will be reading it for some time to come. My edition is 766 pages and I am on page 253. One morning, some weeks after her arrival at Lowick, Dorothea – but why always Dorothea? Was her point of view the only possible one with regard to this marriage? . . . Mr. Casaubon [Dorothea’s husband] had an intense consciousness within him, and was spiritually a-hungered like the rest of us. Throughout most of the book thus far, Dorothea has appeared like a favorite among the author’s array of characters and Mr. Casaubon as a passive antagonist. However, Eliot’s writing reins in what may be some fondness for particular characters with passages like the one above. There’s a kind of fairness of portrayal in Middlemarch that I don’t see often in novels, at least not to this level. And it is a fairness that doesn’t overlook flaws, or skip opportunities for satire or sharp humor. I don’t think Eliot is trying to make you ‘like’ all the characters or think that they are all good. She’s just making sure the reader understands them. 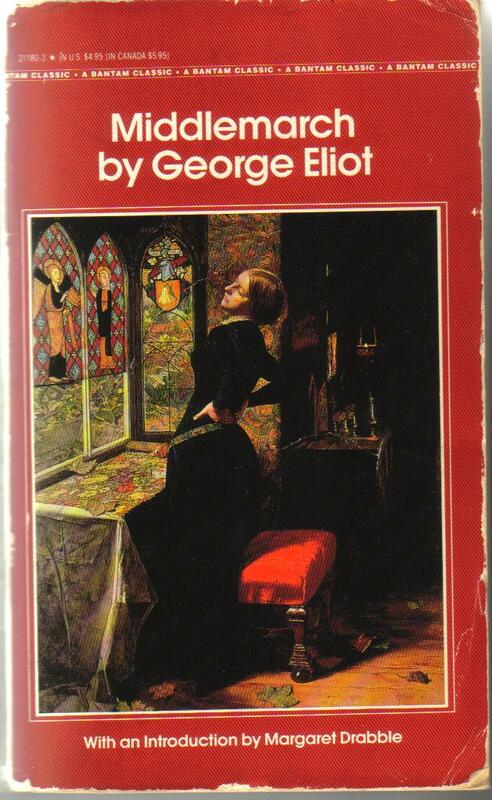 I haven’t studied George Eliot, so I don’t know her philosophies on writing: her writing may not be about ‘being fair’ or spreading understanding. It may be her way of entertainingly dissecting and illuminating the workings of people in society – how their feelings, motivations and worldviews ricochet off each other and turn into actions and decisions that affect other persons, in an ever-rippling chain. Whatever it is, I like it and maybe my slower pace in reading reflects a subconscious desire to dwell in the world of Middlemarch for a while yet. I’ve been planning to read Middlemarch this year for my own challenge to read 19 books older than myself. I had chosen to read it this month due to the Middlemarch Readalong hosted by Ana of Things Mean A Lot. The Readalong took place last week, so I’ve missed it unfortunately, but I’m glad I took it on now anyway. It’s been a good companion in my time of career transition. Middlemarch is the book this week again. I’m really enjoying it, but haven’t been able to spend much time reading lately and it’s a very long book. 1992. 290 pages. Tauris Parke Paperbacks. 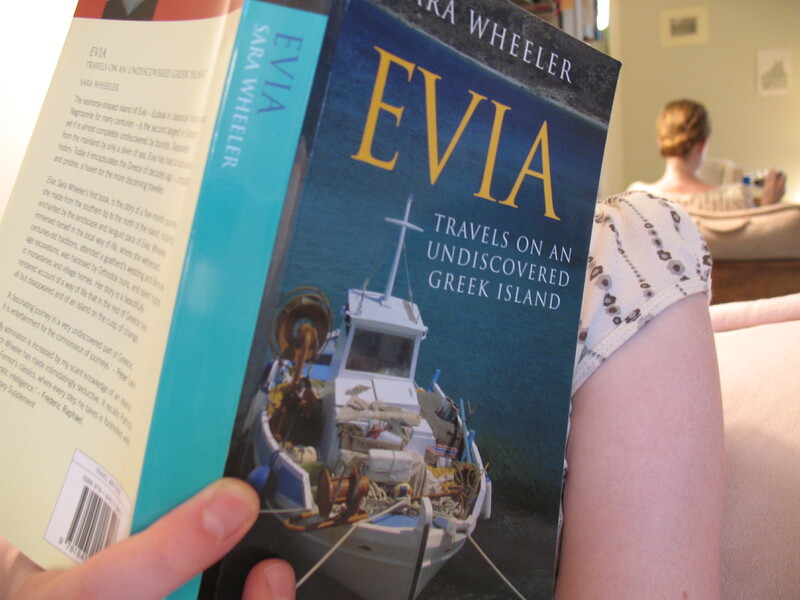 Evia: Travels on an Undiscovered Greek Island is the first book of British travel writer Sara Wheeler. (She is perhaps best known for her later book about Antarctica, Terra Incognita.) Evia (also known as Euboea) is a rural, mountainous island stretched out alongside the eastern coast of mainland Greece. Sara Wheeler first became acquainted with Evia after a time of living and working in Athens. Years later, she decided to travel the whole island. This book chronicles the months she spent traversing Evia. In the preface of this reprinted edition, Sara Wheeler states that she had for many years declined publishers’ requests to republish Evia. Looking back as a more experienced writer, she views her debut book as earnest but structurally problematic. She wonders if readers will find her “meaty – and undigested – slabs of history to their taste.” But she finds value in her depiction of life on Evia, and for that reason, we now have this reprinted edition. I am so glad she consented to this reprint! Writers can be their own worst critics sometimes. I became interested in Evia when Wheeler described a vivid memory of an island monastery in her book Terra Incognita, which I read earlier this year. As when choosing a real-life traveling companion, choosing an engaging and likable travel writer is very important to the enjoyment of the journey. Once you’ve found a good travel writer, you’ll want to go with them wherever they go. Wheeler is such a writer. In her Evian travels, Sara had the distinct and enviable advantage of speaking the language. In many rural villages she visited, she caused quite a stir: a solo British female traveler who spoke Greek! It always warms my heart to read of strangers offering hospitality to travelers and Sara experienced some outstanding hospitality. She was even made a sort of godmother to a newly christened baby at one point. This was especially remarkable considering Sara is Anglican and practically the whole island is Orthodox. Indeed, Sara was implored to convert to Orthodoxy by many islanders along the way, particularly the nuns with whom she stayed on several occasions. Her unmarried state was also of great concern to her new Greek acquaintances. Not only that, but a number of residents apparently never had seen freckles before and thought that something was wrong with Sara’s face. Though admitting some annoyance with the nosiness, Sara gamely took on all that was thrown her way. I liked how her travels did not have a strict itinerary, but were open to some whims and unexpected opportunities. The depiction of life on Evia is warm: I was most moved and fascinated by the way Wheeler captures the fading traditions and slower pace of the island villages. And yet Wheeler is not uncritical. She doesn’t excuse inequality of gender roles and narrow minds. I will say that Terra Incognita is the better written book. Those “undigested slabs of history” that Wheeler describes in the preface? I definitely noticed them and they could be a bit of a slog. (Classics nerds will find a kindred spirit, however.) But the anecdotes and descriptions of Wheeler’s travels more than made up for those denser passages. I really enjoyed sinking into the pages of Evia over my vacation. I always find it refreshing to read about how other people live in the world and how they view people from outside their own culture. I often discover that other cultures contain something I wish mine had more of: palpable community, or amazing generosity. ‘I’m lighting a candle for my wife. She died on 31 May exactly 10 years ago today. We must pray for her,’ said the old man. ‘But it’s 13 June,’ I said unhelpfully. ‘Palaioimerologitis imai‘. He was a follower of the Old Calendar, which meant he was 13 days behind the regular date. There is a sizeable contingent of these people in Greece, even though they are officially excommunicated. Sister Kalliopi and Sister Magdalini went for the jugular. They had spied a small Bible in my room, and it had given them an appetite for a fight. ‘Why don’t you become Orthodox?’ And off they went in a spirited attempt to convert me. On this occasion they were deflected by the splash of the monastic cat falling into the reservoir (a regular occurrence) but subsequently I was not to be so fortunate. Someone shouted that the car had arrived, there was a terrific scuffle, and Vangelitsa and her parents processed out of the house and shot off to the church, with all of us in pursuit, honking furiously. In the main square everyone thronged outside the church, and once the bridal party, by now including three little bridesmaids, was arranged inside, we swarmed in. There were about 250 guests, on the whole dressed fairly casually, including a few with shirts open to the waist and gold medallions languishing on hirsute chests. Most Greek services are fluid affairs (not least because there are no pews), and this was no exception, as people came in and went out, chatted amongst themselves and greeted long lost relations. The priest did request quiet at several key moments, but everyone carried on as if he wasn’t there. My teaser this week is from George Eliot’s Middlemarch. Away from her sister, Celia talked quite easily, and Sir James said to himself that the second Miss Brooke was certainly very agreeable as well as pretty, though not, as some people pretended, more clever and sensible than the elder sister. He felt that he had chosen the one who was in all respects the superior; and a man naturally likes to look forward to having the best. After a lovely two weeks in Maine, I’m back in Maryland. A little recap of my vacation: I stayed at my parents’ house in the town where I lived from fourth grade to high school graduation. My hometown is on the small side, located along a river in central Maine. The closest I can think of a fictional comparison is to the town Empire Falls from the Richard Russo novel of the same name. 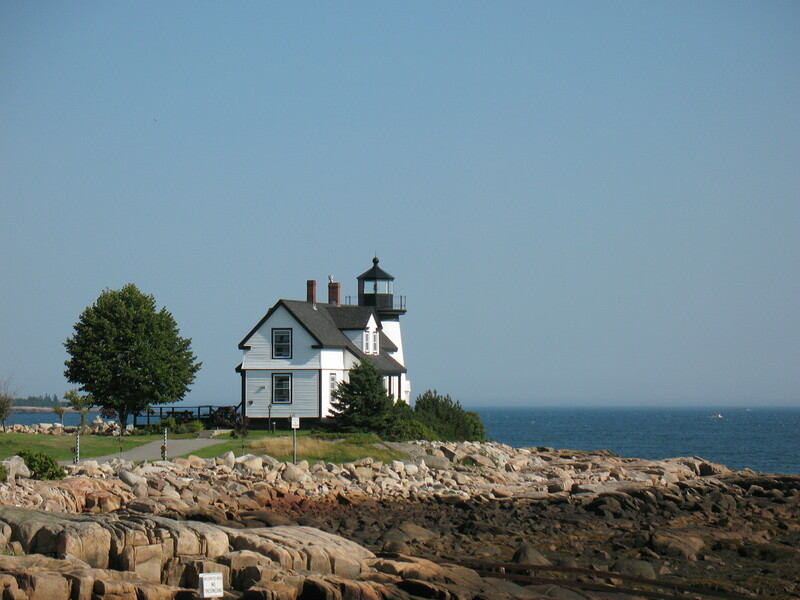 My vacation activities were like a sampler dish of Maine. 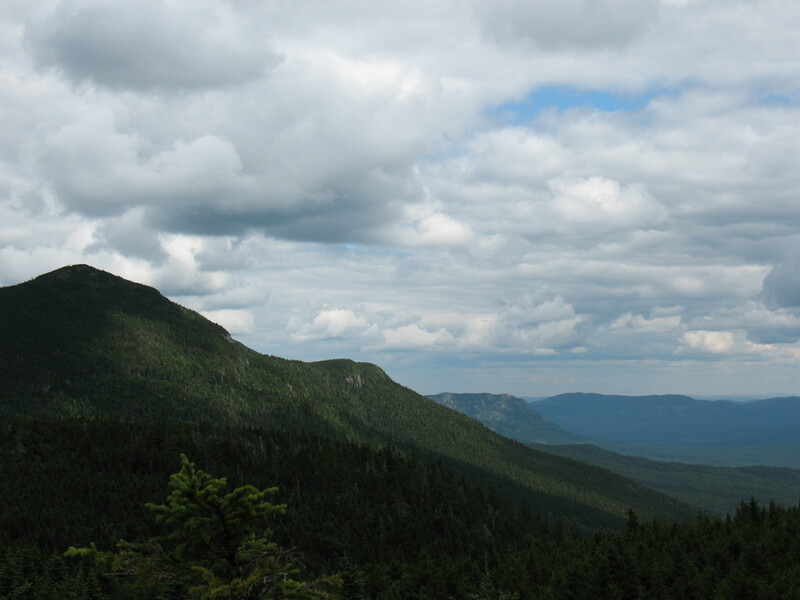 I hiked Bigelow Mountain in western Maine with the youth group of my parents’ church. My cousin and I took a trip to Mount Desert Island and visited some old haunts (I was born on the Island, and worked summers there while in college.) My parents’ blueberry bushes had an abundance of berries and I helped pick them as a light summer rain fell. There were many boat outings during my vacation. My dad is actively trying to convert me to kayaking (both of my parents recently acquired their own.) I kayaked on a lake, on the ocean, and on a river. 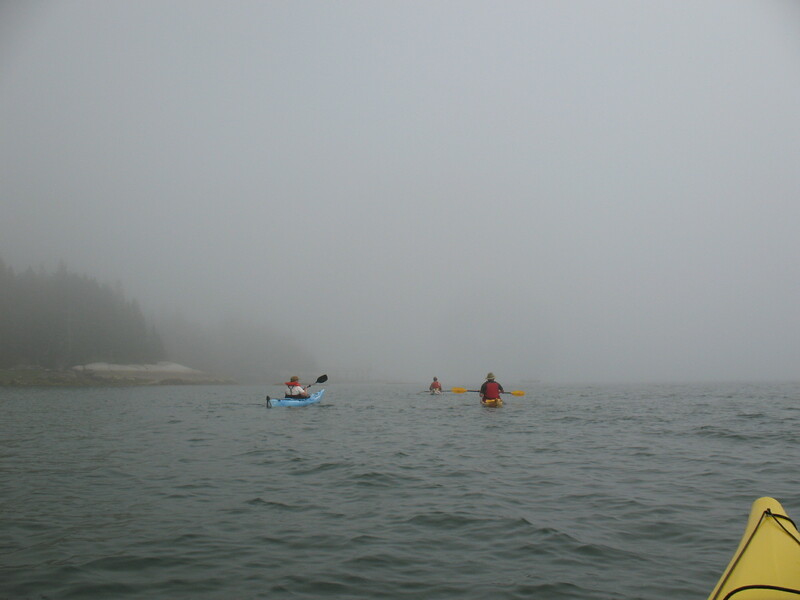 Sea kayaking was definitely my favorite because it feels more adventurous, and also I adore the Maine coast. I had some pretty cool wildlife encounters as well. 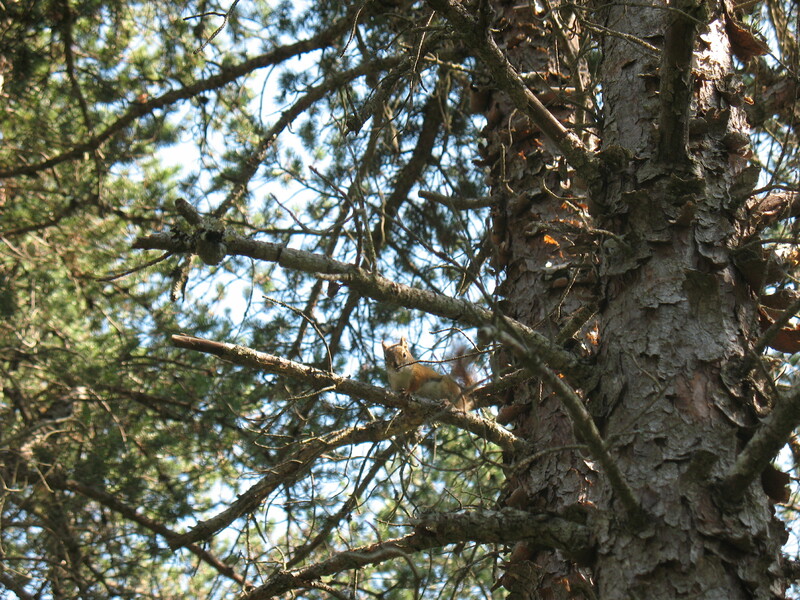 On the hike, we spotted a squirrel running away with the white sphere of a mushroom in its mouth. Toads and a snake also made an appearance. One time I found myself alone on the trail and heard a small rustling. I stood still and watched and soon a shrew came scampering around in the forest debris, making soft squeaking noises. Standing still on a different day’s hike also afforded me a front row view of a red squirrel chattering at me, stamping its feet and brandishing its tail. 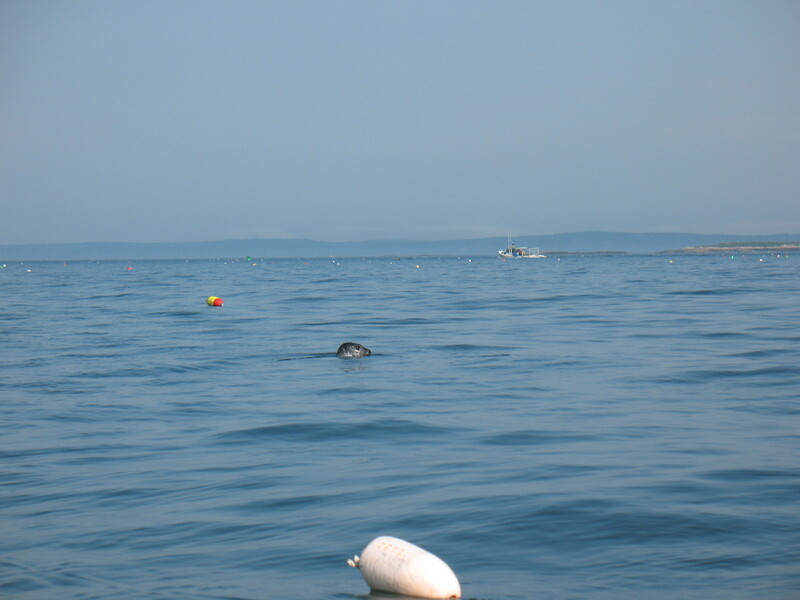 On the sea kayaking trip, we saw seals, as I mentioned in an earlier post. They reminded me of dogs in their mannerisms. 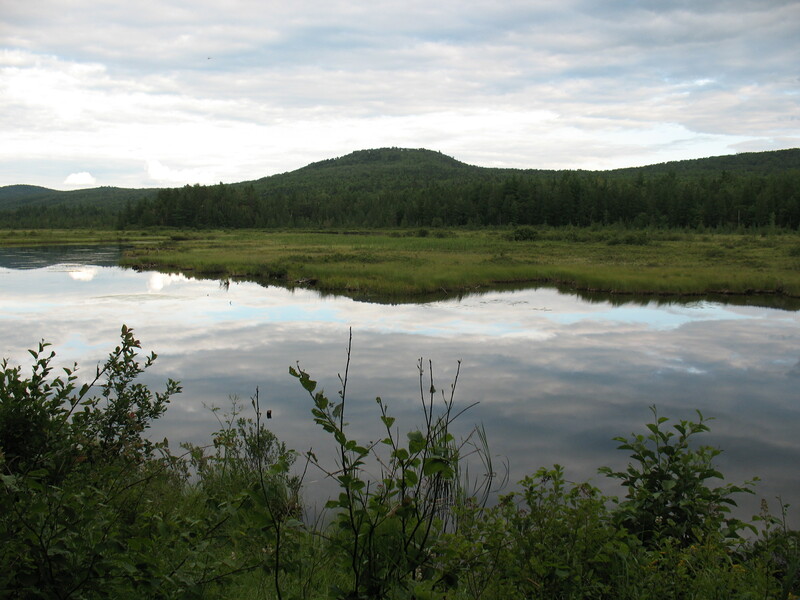 While at the lake for a church picnic, a pair of minks burst out of the bushes chasing each other around, basically ignoring the open-mouthed children nearby. My hometown’s river was the scene for birds of prey, including two juvenile bald eagles who were making a terrible racket. On one trip, I was able to kayak very close to one perched in a tree. (Unfortunately I had no camera with me at the time!) 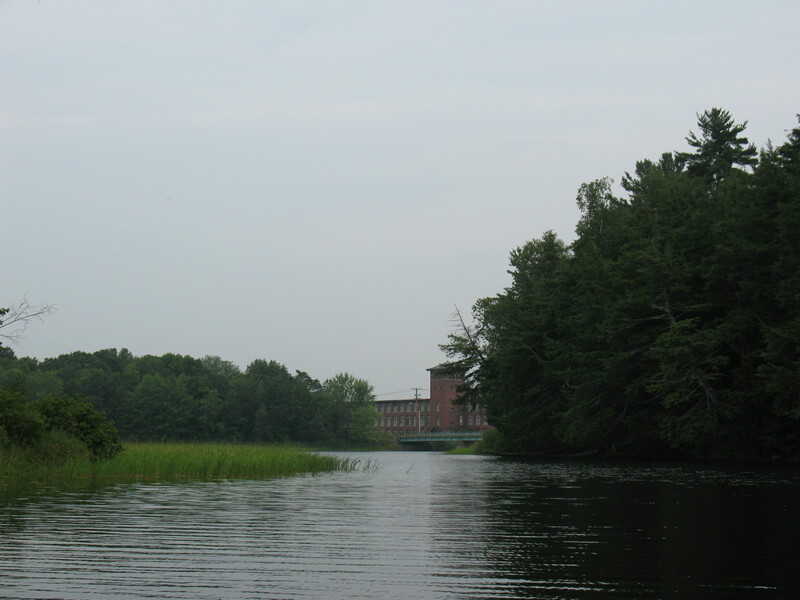 We also saw a loon on the river. On one day, I went to the wedding of my parents’ neighbors and afterward to my ten year high school reunion. I had feelings of ambivalence about my reunion. Though I had some good times in high school, mainly with the music groups and outdoors club, my overall social life was meager and rather lonely. I made some great friends in college and after college and subsequently, high school became like another country to me. So I was pleasantly surprised to find myself having engaging conversations with my former classmates at the reunion. Some were not people I had many interactions with in high school, and I felt in some ways like it took a high school reunion to actually “meet” them. A feisty elderly lady who I had known since I was nine died on my first day of vacation. She was 96 and I was glad that I was able to be there for the graveside service, which her family held on what would have been her 97th birthday. One of my memories of her: she taught my sisters and I to put food coloring in the vases of Queen Anne’s lace flowers. The flowers turn the color of the dye. As I gear up for a return to work tomorrow, I feel very satisfied with my vacation. It was a chance to get out of my routine self, reconnect with people I don’t normally see, and indulge in natural beauty. 1853. 257 pages (including appendices and endnotes). My header of “review” will not be an entirely accurate description of the following paragraphs. I’ll talk a little about Cranford but I’m also going to use it as a launching point for a broader topic of discussion. 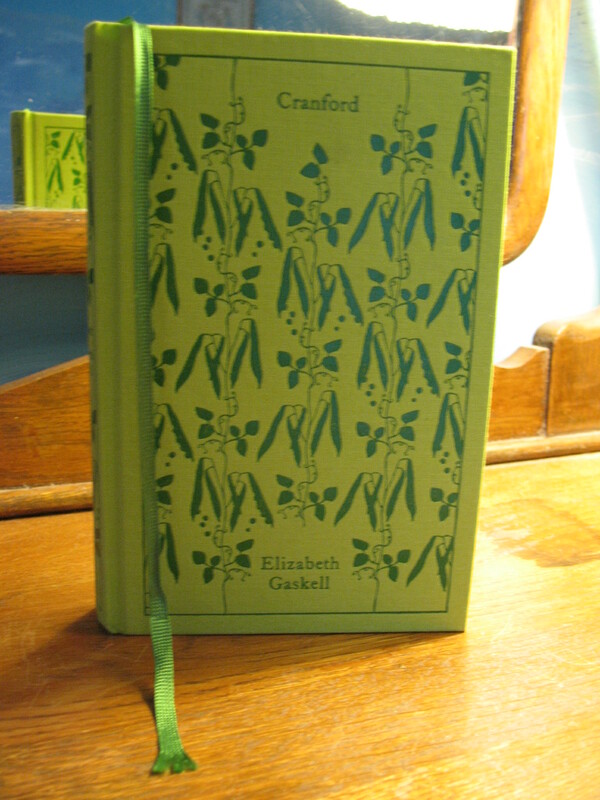 Cranford is the first book of Elizabeth Gaskell that I have read. Its gentle humor, rural locale, and rumination on days gone by made for ideal summer reading. Gaskell’s observations of the elderly ladies of Cranford are affectionate without being too sentimental. It’s a wonderful book and I will make sure and link to others’ reviews of it at the end of my post if you want a more detailed review. My experience of reading Cranford spurred me to think about how books are a product of their time and culture and how that affects the reader’s perception of that book. My edition of Cranford is annotated, with notes explaining customs of the time and place as well as literary and historical allusions. A quick example: in the book, a character goes off to Cheltenham, and the note connected with that sentence explains that it is a spa town. At other times Gaskell quotes poetry, plays and other writings and the notes explain who wrote it and from which work and when it was published. At first, I was not going to read any of the ‘extra’ material provided in my edition. For my first read, I just wanted to keep to the original text and not spoil myself with the introduction, or bother yet with the appendices of a related work of Gaskell. However, the notes proved really useful in helping me to understand phrases and terms, context and connotations. Indeed, I enjoyed the knowledge I was gleaning about the times in which Cranford took place. However, then I started wondering about my own dislike of contemporary literature that includes too many pop culture references. Recently I’ve criticized such books as You Say Tomato, I Say Shut Up and All-American Girl for their frequent pop culture references. I still stand by those criticisms for those two books, but at what point and to what saturation is referencing current culture okay? Additionally, if a contemporary book was constantly quoting other (often recent) poets and writers as Cranford does, it might come off to me as insular or pretentious. But will books written now, set in our present-day, and that incorporate present-day culture, literature and opinions be automatically viewed as ‘dated’ by future generations? Or maybe years and years from now, will some get their own annotated editions? Of course, there are books like Junot Diaz’s The Brief Wonderful Life of Oscar Wao, which already comes with its own footnotes for its sci-fi culture references and notes about Dominican Republic history. And that leads me to another facet of this discussion, which is of course in a given time or era, there are multitudes of cultures in the world. There is no ‘one’ culture for the 2000’s even as there was no ‘one’ culture for Cranford‘s time. One needs footnotes for Cranford not only because it was published in the 1850’s but also because it is written by an English author about a rural village in England. So, is there a point where a book is stuck so deeply in its given culture that no one outside of it will understand it, much less enjoy it? Does time have an affect? For instance, I may find pop culture references hard to take in a book written now or in the 1990’s, but maybe I’m more forgiving – even intrigued – by the same choice displayed in a book, say, from the 1950’s. While visiting with my parents, I’ve been watching episodes of “The Outer Limits” which aired in the 1960’s. The sci-fi show clearly bears the marks of a Cold War mentality and yes, that and its special effects may make it dated, but I kind of like how it encapsulates the era in which it was made. (I may laugh at some of the special effects though.) But its concerns and themes still resonate today, even in its 1960’s trappings. So perhaps, like with me and “The Outer Limits,” a book from today will be viewed later as a quaint capsule of its time and culture for its capturing of its contemporary culture. However, looking back over what I’ve written above, I have alluded or mentioned several times the idea of ‘transcendancy.’ I think there is a need for a book to tap into some essential aspect of human nature and life and imagination to maintain relevance and accessibility with future audiences. I feel that I’ve barely scratched the surface on the topic, so I look forward to your thoughts in the comments to extend the discussion! Let me know if I’ve missed yours and I’ll add it! I’ve been having a good vacation in Maine and today was an especially lovely day: my parents and I went kayaking off of Deer Isle and a couple of its smaller neighboring islands. Some sunbathing seals splashed into the water en masse as we drew near and for the next fifteen to twenty minutes, we could see their heads pop up around us. Kayaking is fantastic for getting up close to nature. Seeing the islands on the horizon reminded me of the cover of Tove Jansson’s The Summer Book (my review here), which reminded me of the wonderfulness of that book, and the awesomeness of islands in both reality and in fiction. Although books have been on my mind, I have not been reading a lot of them this vacation. I slowly worked my way through Elizabeth Gaskell’s Cranford and just finished it this morning. I’ve also been catching up on my blog reading. In my stack of books for this trip, I had brought along a book of Ralph Waldo Emerson’s essays. After reading one of the essays, I realized that – while I like his ideas and writing – it is simply not vacation-mode reading material. I first came across the quotation in an internship supervisor’s office, where a partial version of it was pinned up on the wall. Years later, I put the above fuller version up in my own office where it still resides. I was hoping that it would show up in the book of essays, but it turns out (according to wikiquote) the statement is from a letter Emerson wrote to his daughter. My favorite part of the quotation is where it says “some blunders and absurdities no doubt crept in.” I love how it matter-of-factly acknowledges and accepts that we will mess up and that people or events will turn out weirdly. And though I don’t think that I could or maybe even should completely forget those mistakes or absurdities, I can at least not make them a burden on the next day. Together these quotations urge me not to be consumed by either regret about the past day(s) or by worry for the future day. I often consider these two quotations as calming word-companions for my everyday living. Do you have any quotations that have worked themselves into your everyday life?